Preheat the oil in a deep fryer to 170C. In a bowl, combine the potatoes, cheese, baby spinach, peas, salt, pepper, coriander powder, cumin, cornflour and cashew nuts – mix well with hands by moving ingredients around and pressing it down into the bowl. Make 2cm thick patties and spread these out on a plate. In the deep fryer, fry patties for 3-5 minutes at 170C until it’s 80% done; lift basket and rest for 1-2 minutes, then fry once more for 1 minute at 190C – this makes the patties nice and crispy! Mint sauce: blend the mint leaves, coriander leaves and shallot into a paste and then add Greek yoghurt, salt and pepper and fresh ginger – mix well. 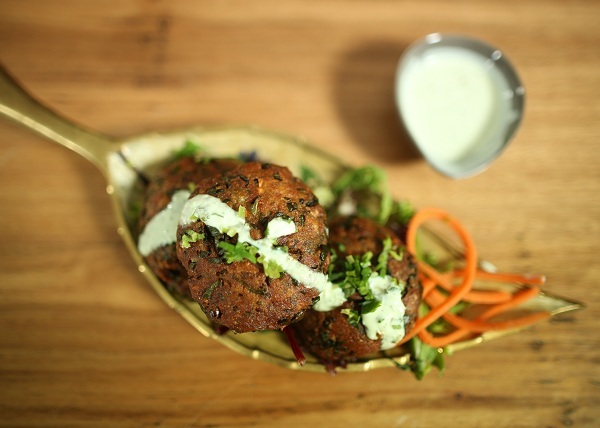 To serve, place vegetarian cutlets over green salad and top fresh coriander, and the delicious mint sauce.